Slieve Aghkerane comes from 'A New Map of Ireland' by Daniel Beaufort 1797 which is, in this area based on MacKenzie's sea charts of 1776. (Barry Dalby) It was the tradition for local children to gather bilberries on the mountain, and also another kind of small white berry called caora aitinn, which were bottled in whikey, buried, and kept as remedies for ailments. This took place on the last Sunday of July, known locally as Garlic Sunday (apparently a corruption of 'garland') or Domhnach Chrom Dubh [MacNeill, 191-92]. Previously Cullydoo in MV. Slieve Aghkerane is the 441st highest place in Ireland. 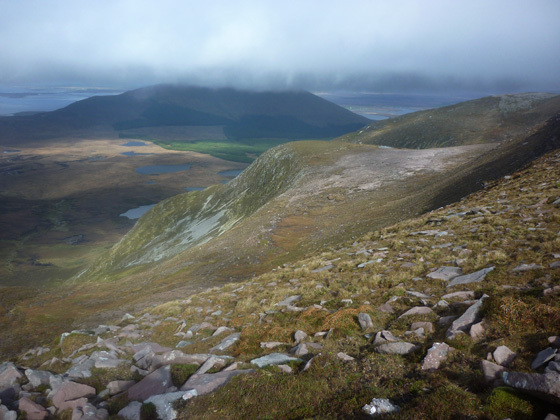 Slieve Aghkerane is the second most easterly summit in the Achill/Corraun area. Picture from Harry Goodman : Looking NE to Knockletragh from the shoulder of Corraun Hill East Top. Picture: Looking NE to Knockletragh from the shoulder of Corraun Hill East Top. Mist, mist and more mist!